Similar to a sales funnel, the buyer’s journey explains the process an individual goes through when deciding to work with an organization. While it may not be clear cut, every individual goes through each step of the process when making purchasing decisions. The journey starts with Awareness before moving on to Consideration, then finally ending with Decision. It’s important to share different types of content for each of the different stages as what your audience cares about is largely dependent on where they are in the decision-making process. While there are many mediums through which messages can be shared, video is growing in popularity and has unique benefits to utilizing. Not only are people watching over 100 million hours worth of video each day on Facebook, but it’s also driving purchasing decisions. 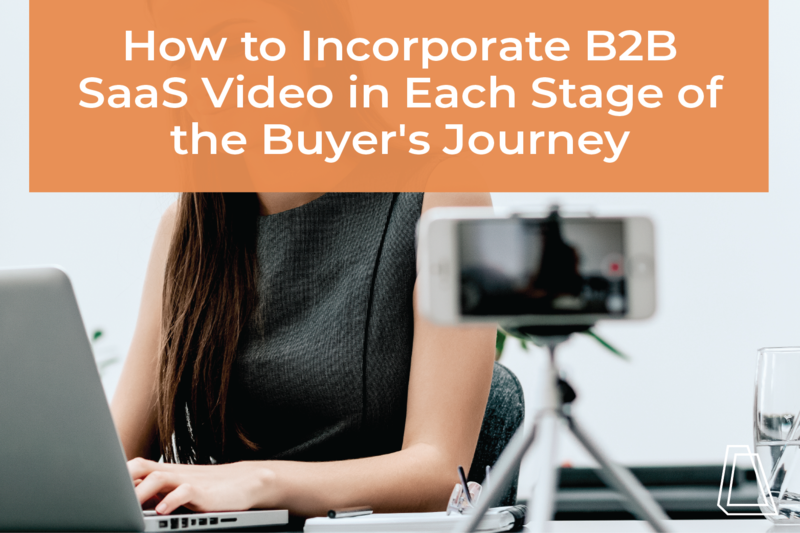 This article is going to discuss how your B2B SaaS startup can utilize video in each stage of the buyer’s journey, with the goal of converting prospects to customers. In the awareness stage, individuals are just learning about a problem that they have. They might not be certain of what their problem is, but they can relate to pain points. During the awareness stage, it’s crucial to provide value to your audience by educating them. This isn’t the time to sell your services -- it’s the time to establish your organization as a subject matter expert (SME). Here, you should create videos that educate your audience. Look at your buyer personas and consider what challenges they may relate to and create content to help them work through those challenges. Share these videos on social media, in social ads and within blogs. Remember to consider where the persona you’re targeting spends most of their time. Example: How to Create a Buyer Persona in Five Minutes - The audience might not yet know that they need to be segmenting their audience with buyer personas, but you can teach them why it’s important and how to do so. When discussing creating Awareness stage content, we often hear people are worried about giving away the farm. The truth is, you could use all of our blogs and resources here and reverse engineer our process, but it doesn’t make sense for everyone. This is the same case for your business. While there may be a small portion of your audience who is going to want to just do it themselves, often you’ll find individuals are quite intimidated by the undertaking required and would prefer to work with you, which is why it’s important to establish yourself as trustworthy and qualified. In the consideration stage, individuals now recognize that they have an issue and are actively seeking a solution for it. In this stage, education is still important, but it’s time to start introducing the benefits associated with your company specifically. Continue providing value with educational content, but more and more share information about what you do. These videos do well in targeted social ads, blogs and emails where individuals are already being segmented by interest to ensure you’re providing relevant content. Example: How Our B2B Agency Converts More Leads -- and How You Can Too! - At this point, your audience knows they want to convert leads, but doesn’t know how to go about it. You are still educating them while also showcasing the power of your organization. It’s important to remember to continue to provide value even as you move through the buyer’s journey. As you start incorporating more sales information, keep educating your audience to continue to establish your organization as an expert. In this final stage, individuals are aware of their problem and are ready to choose a solution for it. Here, demonstrating the value of working with your organization becomes increasingly important as prospects grow closer to making a purchase decision. This is where you should be encouraging your audience to schedule a demo or set up an introductory call, as they’re warmer leads. Ensure that the videos you produce here are still providing value to your audience while also incorporating more about your business. This is a good time to highlight your unique benefit with case studies and statistics while supporting the data with highly-personalized messaging. It’s time to get very targeted here: share these videos in highly targeted ads, emails and on landing pages. Example: Case Study: How B2B SaaS Agency ABC Grew 10x with Accelity Marketing - Your audience knows they want to grow and will connect working with Accelity as a way to do so. You can still educate your audience by way of statistics and industry relevant information. While Call-to-Actions are important with every piece of content, they’re even more important here. Don’t forget to tell your audience what their next step should be to continue to encourage conversion. Video is a valuable tool that can provide immense benefits without breaking the bank. Not sure where to begin? We put together an ebook to help you start creating videos, even if you’re on a tight budget.